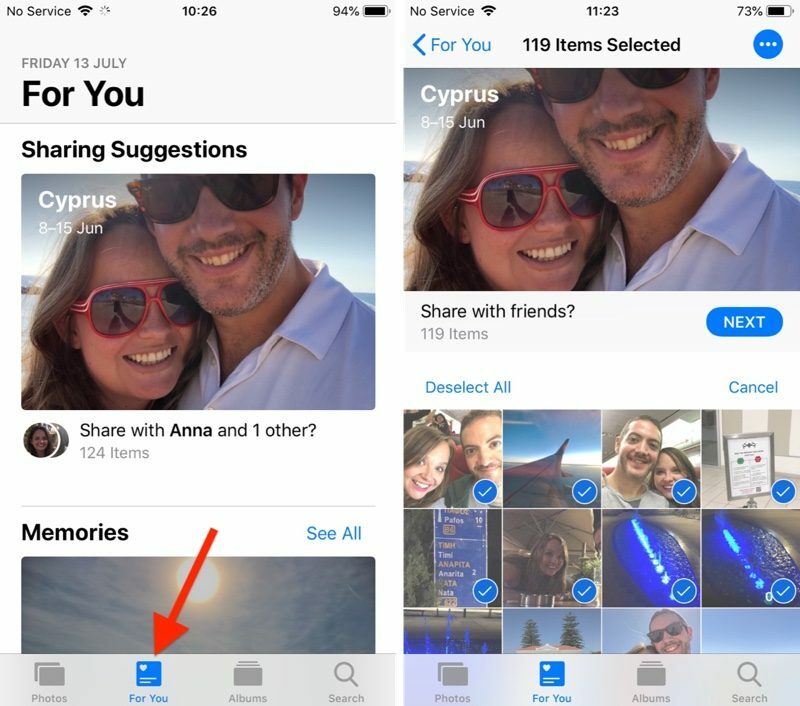 The most prominent addition in the Photos app is a new For You tab, which replaces the old Memories and Shared tabs and brings together their features – along with any iCloud Shared Albums you may have – in a single scrolling panel. Top of the For You tab is where your latest Sharing Suggestions appear. 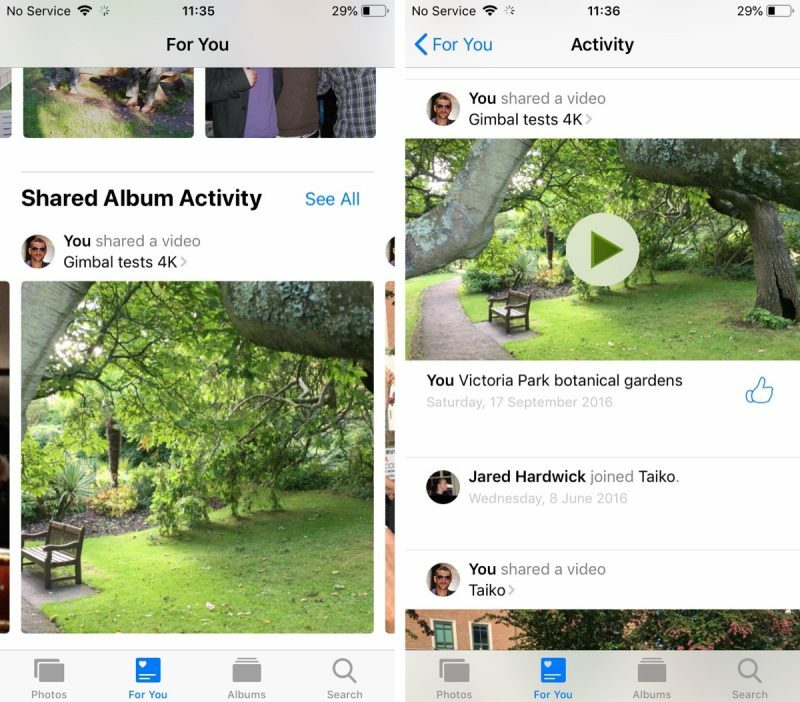 If the app recognizes someone in the photos it will ask if you want to share the collection with them, otherwise an option to "Share with friends?" is shown. The great thing about sharing photos this way in iOS 12 is that if your friends have any pictures that are from the same event, time, or location, they will also be prompted to send those back to you, allowing you to fill any holes in your collection. Tap the Sharing Suggestions card and you'll be taken to a screen where you can choose the pictures you want to share. Tap Select and then tap any photos you don't want to include, or choose Deselect All and then tap the ones you want to share. Choose Next to select people in your contacts that you want to share the pictures with. Tap Share in Messages when you're done – just note that anyone with access to the shared photo link will be able to view the photos. Immediately below Sharing Suggestions you'll find Memories, which curates various photos and videos you've taken in the past into specific memory collections. Without any steps required on your part, Memories gives you an automatic homemade movie from these past family gatherings or vacations. Tap a memory and you'll see a list of all the photos and videos contained in the memory (tap Show More to see more than a summary), the geographic location the pictures were taken, nearby photos, and related memories you might be interested in. If you press the play button to begin viewing a memory, you can also use a number of customization options to edit it. For more on editing memories in Photos, see our dedicated tutorial. 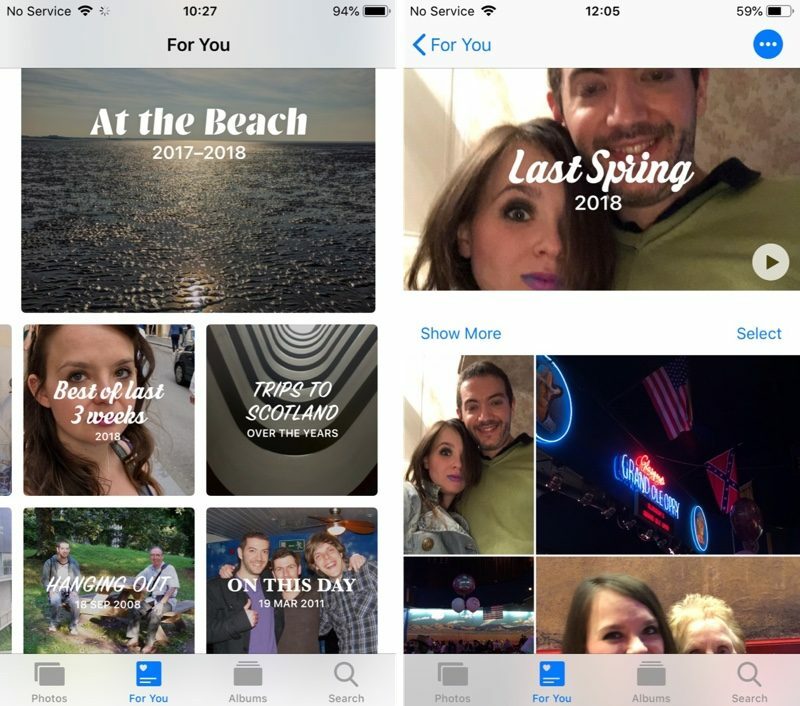 Note that tapping Select on this page and deleting a photo doesn't just remove it from the memory, but also deletes it from your iPhone and iCloud Library. The last two options at the very bottom of the screen let you favorite the memory or delete it permanently. If your device supports 3D Touch, you can also hard press on any memory in the For You tab to get a preview of its contents, and then swipe up for options to add it to your favorite memories, delete the memory, or block it. At the bottom of the For You tab is any Shared Album Activity related to your iCloud account. This lists iCloud albums shared by you as well as albums shared with you by other users. From here you can view photos and videos, "like" them with a thumbs up, and read comments or add your own. In iOS 12, the Photos search function in the Search tab is more intelligent than before, so it's easier to find the most relevant photos to you from events, people, or places. You can also combine multiple search terms to narrow down your results. 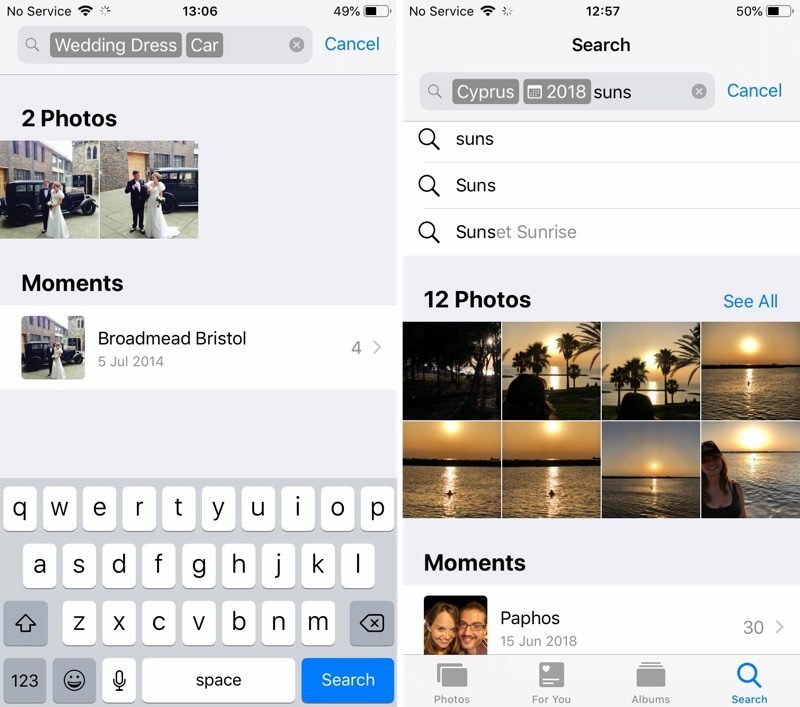 Simply start typing a person's name, a date, a place, or a word like "cat", "beach", "waistcoat", or "selfie", and the Photos app will offer up similar or identical indexed search terms that you can tap to add to the search field. Imagine how “intelligent” it would be if you could actually TAG A PHOTO. What I would like is the ability to turn this kind of stuff off. All I need is a dumb folder to store photos. My app is set to the "Albums > All Photos" view, and that's it. I never navigate to anywhere else from there. The Photos app was a real mess before, and this just looks like it will make things even more of a confusing mess! Its not just this photos stuff but iOS 12 is a significant improvement despite them claiming it was a performance focussed update. Maybe it’s just me but I’m really looking forward to the new sharing feature as that’s exactly how my family shares photos anyway. This just makes it a lot easier. I don’t want photos to just be an album. That feature already exists. Manually? I used to do that when we were all using iPhoto and digital cameras. Now? I take like hundreds or maybe a thousand of photos each month, I don't have time for that. Another ridiculous omission: You create an folder to put albums in, but you can't actually move albums into folders. Only Photos.app on a Mac can do that. You’re absolutely right!! Just like Music, all I need is something to play my downloaded tracks, period! Choose Next to select people in your contacts that you want to share the pictures with. Tap Share in Messages when you're done - just note that anyone with access to the shared photo link will be able to view the photos. If you press the play button to begin viewing a memory, you can also use a number of customization options to edit it. For more on editing memories in Photos, see our dedicated tutorial ('https://www.macrumors.com/how-to/ios-10-photos-edit-memories/'). [doublepost=1541694168][/doublepost]I just want BASIC features like be able to change file names and sort them myself into albums- or better yet, tag them, export the whole thing onto USB with the tags. All these new features are completely useless for me. Is macrumors gonna repost all these “new features” articles when iOS 12 is, you know, actually released and in use by a majority of their user base? It turns out, yes they are.